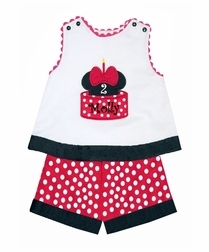 This is the cutest Disney themed Minnie Mouse birthday oufit! We start with a white top and trim the neck and arm openings with red ric rac. The bottom of the top has black ribbon. The trousers are made with red with white dots fabric and are also trimmed with the ribbon. The front of the top is appliqued with a Minnie Mouse cake made of red with white dots fabric to match the trousers, a black Minnie ears hat and a red bow. One candle is in the top of the ears hat with a yellow flame. 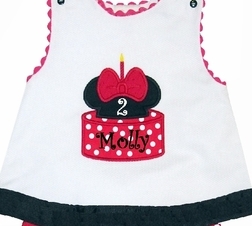 Your little one's number birthday is embroidered on the black ears hat, and her name is monogrammed in black Curlz font on the cake itself.